This Monday, Sept. 4, 2017, satellite image provided by the National Oceanic and Atmospheric Administration shows Hurricane Irma nearing the eastern Caribbean. Authorities in Florida have begun bracing for the potential arrival of Hurricane Irma, a roiling storm that intensified into “an extremely dangerous Category 5 hurricane” as it churned toward the United States. Even as millions across Texas continue reeling from the impact of Hurricane Harvey, which battered that region with record-setting rain and was blamed for at least 60 deaths, Irma gathered strength in the Atlantic, prompting increasingly dire forecasts as well as hurried storm preparations in Florida, where a major hurricane has not made landfall since 2005. Local officials have begun urging people in Florida to leave areas that could take a direct hit from Irma. Miami Dade County Mayor Carlos A. Gimenez said Tuesday that officials could ask some of the county’s 2.7 million residents to begin evacuating as early as Wednesday, calling Irma’s potential impact an “all hands on deck” situation for local officials. Subscribe to the Post Most newsletter: Today’s most popular stories on The Washington Post “This hurricane is far too powerful, poses far too great a threat for us to delay actions any further,” Gimenez said at a news briefing. Gimenez said county residents with special needs will be evacuated on Wednesday morning, and he added that more evacuations may be ordered in Miami-Dade, the state’s most populous county. 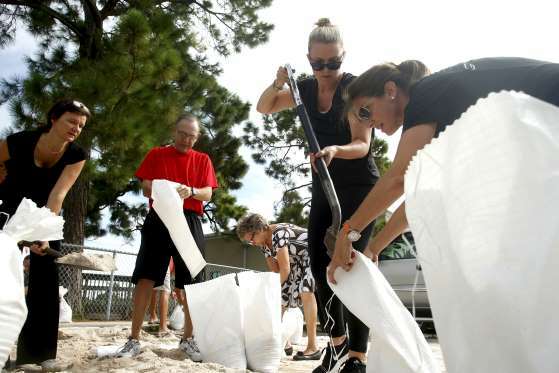 Gimenez also urged people in the county to have at least three days worth of food, water and other basic supplies on hand. Officials in Monroe County — home of the Florida Keys, a popular tourist destination — said Tuesday they had issued a mandatory evacuation for tourists beginning on Wednesday morning at 7 a.m. A mandatory evacuation for residents was also issued for Wednesday evening at 7 p.m. In a statement, Monroe County officials said they urged residents and tourists to begin planning evacuations immediately, saying that “the earlier people leave the Keys the less traffic they are likely to encounter.” Authorities also said Monroe County schools would close Wednesday and remain shuttered until further notice, while hospitals there had begun planning to evacuate patients. Florida Gov. Rick Scott (R), who has declared a statewide emergency, wrote to President Trump on Tuesday asking him to declare a pre-landfall emergency in Florida, warning that Irma may require large-scale evacuations. He also asked for federal assistance in constructing emergency berms needed to protect areas across the state already battered last year by flooding caused by Hurricane Mathew, which raked the state with punishing rain and winds before making landfall in South Carolina. The last major hurricane — registering as a Category 3 storm or stronger — to make landfall in Florida was Hurricane Wilma in October 2005. Wilma was also the last major hurricane to make landfall in the United States until Harvey arrived in Texas late last month. 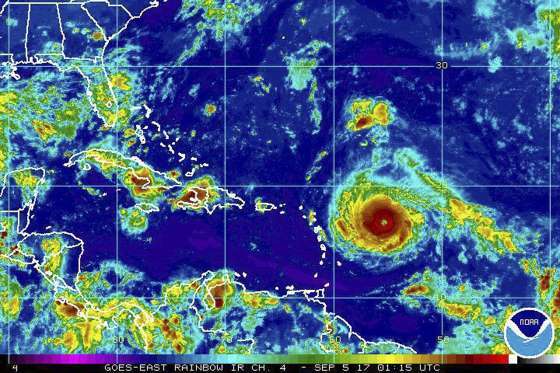 The National Hurricane Center said Tuesday morning that Irma had become a Category 5 storm, with NOAA Hurricane Hunters reporting maximum wind speeds of 175 mph — making it among the strongest hurricanes ever recorded in the Atlantic Ocean, according to the Capital Weather Gang. The Capital Weather Gang said that Irma’s forecast track shifted to the south and west over the weekend, putting the hurricane on course to approach the Florida Keys by Saturday. The hurricane’s surging growth has sent many Floridians into familiar pre-storm routines of preparing hurricane shutters, stocking up on supplies and nervously monitoring the news. 5 AM: Irma has max sustained winds 150 mph. Scott said Irma’s potential impact — which could include millions of people in Florida and beyond — warranted the emergency declaration, which ordered state officials to waive tolls on public highways and prepare public facilities such as schools to be used as shelters. If Irma does make landfall as a Category 4 storm or stronger so close after Harvey’s impact on the Gulf Coast, it will be the first time on record that two storms of that strength hit the United States during the same hurricane season. Other areas also looked warily at Irma as it traveled through the Atlantic. The National Hurricane Center said Tuesday there could be up to 12 inches of rain across parts of the Virgin Islands and Puerto Rico. Angela Fritz and Jason Samenow contributed to this story, which has been updated since it was first published at 8:47 a.m.